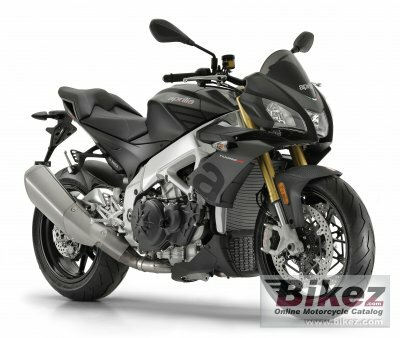 2019 Aprilia Tuono V4 1100 RR. Picture credits - Aprilia. Submit more pictures. The dynamic control suite derived directly from the winning technology used in the world Superbike series, the most complete and refined of those currently available on the market. Driveline: Straight cut gears and integrated flexible coupling, drive ratio: 73/44 primary drive. Chain 42/16 final drive. Front suspension: Upside-down �one by one� Sachs fork, � 43 mm stanchions. Forged aluminium radial calliper mounting bracket. Completely adjustable spring preload and hydraulic compression and rebound damping. Rear suspension: Double braced aluminium swingarm; mixed low thickness and sheet casting technology. Sachs monoshock with piggy-back, fully adjustable in: spring preload, hydraulics in compression and rebound. APS progressive linkages. Front brakes: Double disc. ABS. Floating stainless steel discs with lightweight stainless steel rotor with 6 studs. Brembo radial callipers with 4 diam. horizontally opposed 32 mm pistons. Sintered pads. Axial pump master cylinder and metal braided brake hoses. Rear brakes: Single disc. ABS. Brembo floating calliper. Wheels: Cast aluminium wheels with 3 split spoke design. Electrical: Flywheel mounted 420W alternator with rare earth magnets. Ask questions Join the 19 Aprilia Tuono V4 1100 RR discussion group or the general Aprilia discussion group. Enter your e-mail to join the 2019 Aprilia Tuono V4 1100 RR forum and get notification of answers and new messages about this bike. You can unsubscribe with a single click. Bikez does not display, sell	or misuse e-mail addresses. Bikez has discussion forums for every bike. View comments, questions and answers at the 2019 Aprilia Tuono V4 1100 RR discussion group. You can sign up for e-mail notifications when other riders answer you. If you have extensive experience with the MC, please send us a review. If you consider buying this bike, you should view the list of related motorbikes Look at photos. Compare technical specs. And check out the rating of the bike's engine performance, reliability, repair costs, etc. You can compare the rating with other bikes.